100-A: Stainless steel, star wheels idler. 100-B: Steel star wheels hauler. 101-A: Stainless steel star wheel idler. 101-B: Steel Star wheel idler. Pulling longlines up onto the boat. 100-A: 1400 to 2700 lbs for continuous pull and 20% more at 2600 PSI for intermittent pull. Tadial load maximum continuous at 500 lbs. Maximum hydraulic flow 33gpm. 100-B: 1500 to 2900 lbs for continuous pull and 20% more at 3000 psi for intermittent pull. Radial load maximum continuous at 8000 lbs. Maximum hydraulic flow 53gpm. 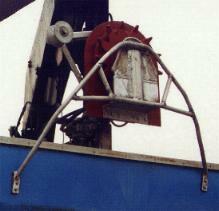 Star wheels hauler attaches to side of boat along with star wheel idler. 101-A cam be ised wotj 1/2" tp 3/4" longline. 101-B can be used with 1/2" to 1' longline. Copyright � 1999-2004 Fukui North America. All rights reserved.